This Vanilla Mousse Cheesecake was exactly what I was hoping for: light and creamy. Cheesecake is not the first thing I would order off of a dessert menu. Most of the time it is too dense and heavy for me. This cheesecake was awesome. I think my father-in-law said, “out of this world!” This is on my go-to list of dessert recipes now. It was very easy to make. And because it chills in the fridge, its great to make ahead of time. The tricky part is knowing when its ready to come out of the oven. This was my first try at a cheesecake, and I just left it in a few minutes extra to be on the safe side. There were cracks on the top, so I don’t know if that’s normal or if I could have done something different to prevent that. Either way, it was divine. This is a must-have recipe! Heat oven to 325 degrees. Mix wafer crumbs and butter; press onto bottom of a 9-inch springform pan. Beat 3 packages of cream cheese, 3/4 cup sugar and 1 tablespoon vanilla with mixer until well blended. Add eggs one at a time, mixing on low speed after each just until blended. Pour over crust. Bake 50-55 minutes or until center is almost set. I baked mine an additional 5-10 minutes. The cake still “jiggled” but the top was set when I touched it. Run a knife around rim of pan to loosen cake (I don’t know if you are supposed to do this right out of the oven, or after it cools slightly. It pulled some of the cake up when I did it). Cool completely in pan. Beat remaining cream cheese, sugar and vanilla with mixer in large bowl until well blended. Whisk in cool whip; spread over cheesecake. Refrigerate 4 hours. Remove rim of pan before serving cheesecake. Garnish with fresh berries. Mix wafer crumbs and butter; press onto bottom of a 9-inch springform pan. 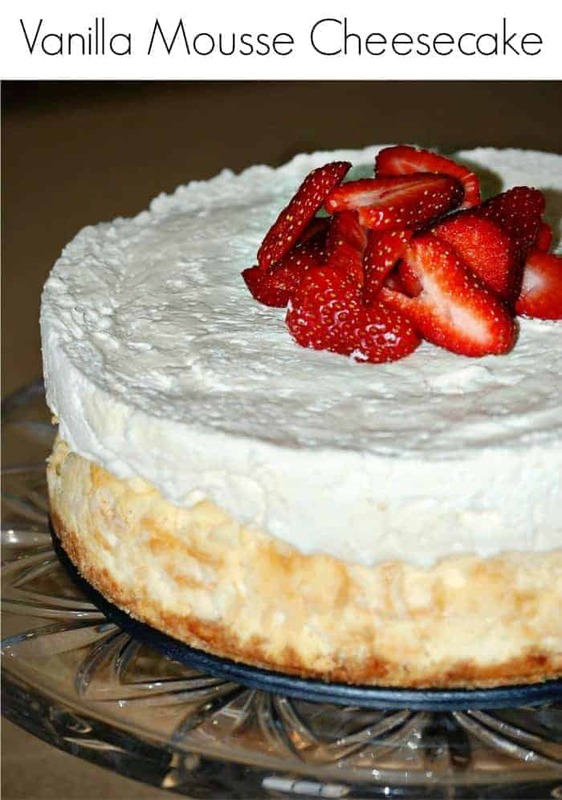 Beat 3 packages of cream cheese, 3/4 cup sugar and 1 tablespoon vanilla with mixer until well blended. Add eggs one at a time, mixing on low speed after each just until blended. Pour over crust. Bake 50-55 minutes or until center is almost set. I baked mine an additional 5-10 minutes. The cake still "jiggled" but the top was set when I touched it. Run a knife around rim of pan to loosen cake (I don't know if you are supposed to do this right out of the oven, or after it cools slightly. It pulled some of the cake up when I did it). Beat remaining cream cheese, sugar and vanilla with mixer in large bowl until well blended. Whisk in cool whip; spread over cheesecake. Remove rim of pan before serving cheesecake. Sounds delicious! Thanks for sharing.